Adult or pediatric first aid course plus a first aid kit. The A-Z of first aid. Book an adult or pediatric first aid course and a first aid kit to take home with you. Our team of highly trained nurses offer interactive, fun training courses with practical real life examples. The courses are valid for 2 years and are accreditated by the Dubai Corporation for Ambulance Services. 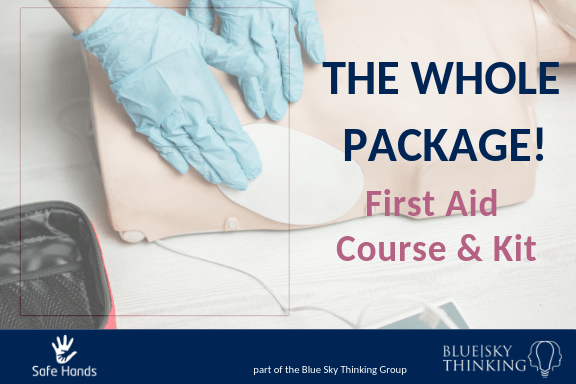 You will also take home a comprehensive first aid kit which has been put together by our team of specialist nurses. The above courses will be held at Business Bay or another community location and are shared courses. There will be a minimum of 6 participants and a maximum of 12 participants. Safe Hands is a Dubai based first aid training company that was set up in 2014 and is certified by the Dubai Corporation for Ambulance Services (DCAS). Safe Hands has run over 300 courses to date and courses are run by British qualified nurses with experience working in some of the UK’s leading hospitals and includes specialist pediatric nurses. How much sleep do you and your baby need? Your baby may be getting enough, but are you? Is your home child proof? Safe Hands offers certified first aid training courses for individuals at our Dubai training centre as well as courses for private companies and groups at locations of their choice. I wish to be notified by SafeHandsUAE via email.